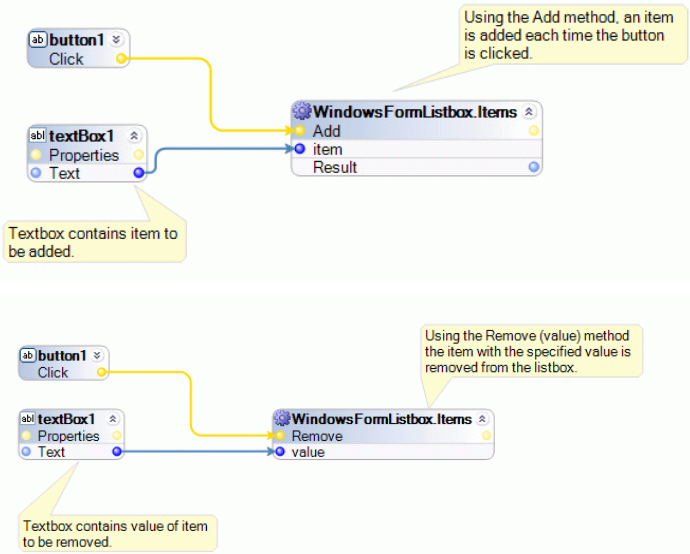 Highlight the control in Object Explorer. Click Explore Component Properties at the top of Object Explorer. On the list of properties that displays, highlight the Items property. To see a list of available properties and methods, click Configure Type. Items.Add – Adds an item at the specified index. Items.AddRange – There are two AddRange methods, AddRange(ObjectCollection value) and AddRange((Object items). To add an array of items, use the AddRange(Objec items) method. Items.Clear – Removes all items from the list box or combo box. 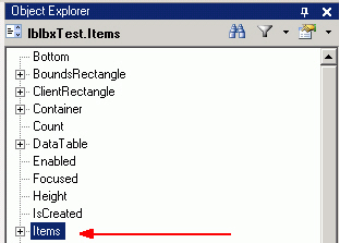 Items.Remove – Removes the item with the specified value. Items.RemoveAt – Removes the item at the specified index.